These pretty little candied orange slices dipped in dark chocolate are the perfect sweet snack to enjoy all your winter citrus. 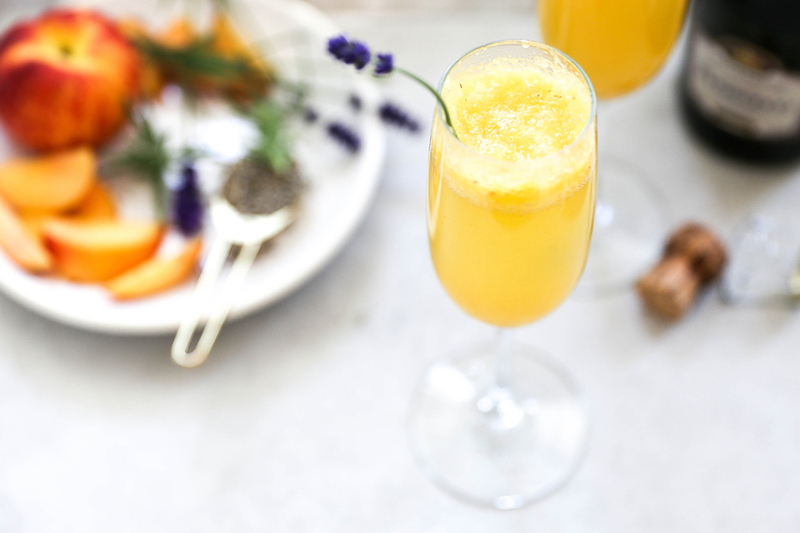 Created by Lauren from Climbing Grier Mountain, Harry & David Cara Cara Oranges shine like the sun in this simple, 5-ingredient dessert recipe. Citrus. A welcome burst of sunshine during these cold winter months. As a kid I remember my grandfather talked about getting an orange as a birthday gift. My six year-old self didn’t understand it at the time. Why would he want an orange for his birthday and not a Transformer action figure? Well, fast forward to my adult life and now I anxiously await for citrus season to be upon us. It’s like a whole new culinary world to explore. Because, let’s be real, one can only eat so many root vegetables during winter before they start to taste a little boring. Anyway, there are so many options to when it comes to eating or cooking with citrus fruit, specifically oranges. Eating them plain is always a great idea, but have you ever made a candied version? Game changer. If you’re going to make an orange dessert you have to use the best oranges you can get your mitts on. Which is why I am head over heels in love with Harry and David’s Cara Cara Oranges. They may look like your average navel orange, but peel the skin back and take a closer look. What you’ll find is a pinkish-red flesh, often times seedless, less acidic, and tastes like a mixture of cherry, raspberry and cranberry. 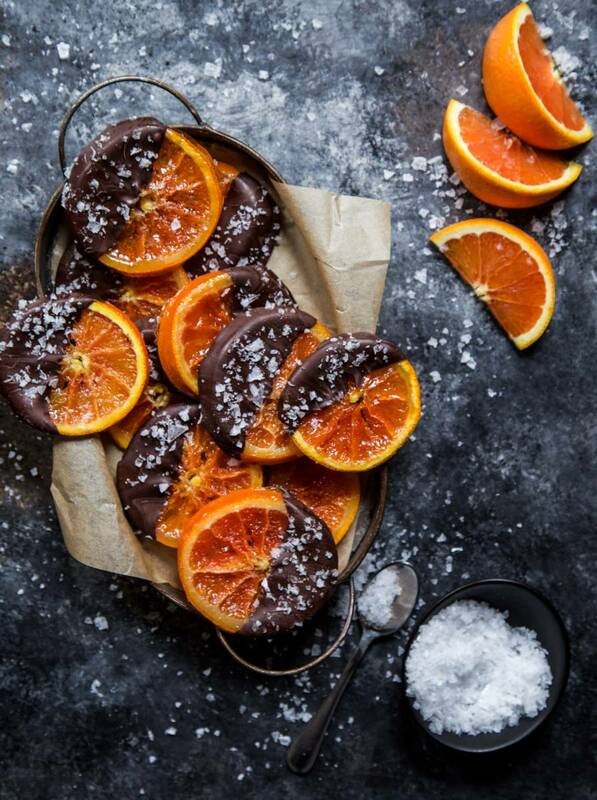 Cara Cara Oranges are the star of these Candied Orange Slices with Dark Chocolate. It’s a simple dessert combining two of the best flavors: citrus and chocolate. 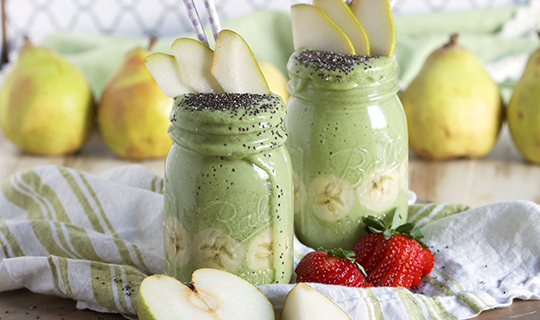 Make these slices for yourself to boost your day or for a friend. These candied oranges will definitely keep Old-Man Winter at bay. Line a baking sheet with parchment paper and set aside. Next, slice the Cara Cara Oranges into 1/4″ slices removing any seeds. In a wide, large skillet combine granulated sugar and water. Bring the skillet to a boil and continue continue to whisk until the sugar has dissolved. Next, add the orange slices to the skillet and lay in an even layer. Bring the skillet to a simmer. 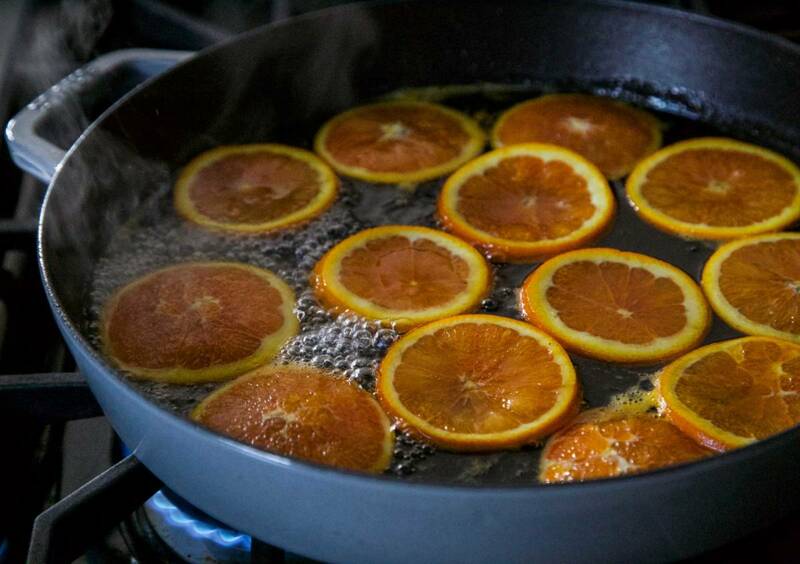 Let the orange slices simmer for about 1 hour uncovered or until they become transparent. Once the orange slices have become transparent, place the slices on the baking sheet lined with parchment paper. Let the orange slices dry for at least 24 hours uncovered. They will still feel a bit sticky but that’s okay. Next, place the chocolate chips in a microwave safe bowl and melt on high for 10 to 15 second intervals. Once melted, dip half an orange slice into the chocolate and place back on the parchment paper to set. Sprinkle with sea salt if desired. Repeat process until all orange slices have been dipped. Wait for about 15 minutes until the chocolate hardens to serve.